I was off to my usual favourite haunt in Wales last week, taking a break and enjoying some peace and me time. Part of this was sat on a very deserted beach listening to the waves roll gently onto the rocks and reflecting on everything that life has to offer. The beach was covered in lovely smooth round pebbles and stones, each unique, each beautiful in their own way (if you like rocks….). Most of them were plain, different shades of rather monotone grey, but some caught my eye.. In fact I picked a couple up and put them in my bag to bring home, different to the majority, ringed with lines of quartz and white bands…. [Where the heck is he going with this….?] Bear with me…. Then I noticed another, not round, but snapped in two, sheared and broken down the middle. 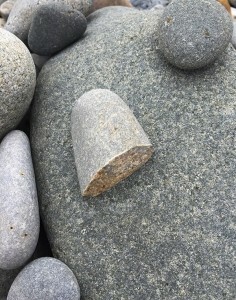 In fact it had broken along one of these quartz rings…. So my point? 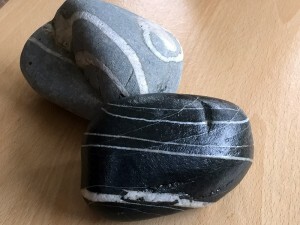 Well, simply this, that the very thing that made these pebbles stand out and be so very unique and special was also the very ‘fault’ that turned out to be a weakness and could lead to them to fail and break…. I couldn’t help but revel in my rocky epiphany for a while and marvel at how true this was for us as well, the faults we have, the things we judge as our weakness and failure points are also perhaps the most beautiful parts about us. That was it. Lesson over….